YouTube live streams are generally pretty good, but getting noticed in the live comment stream is tricky, especially when there are thousands or even hundreds of thousands watching or commenting. 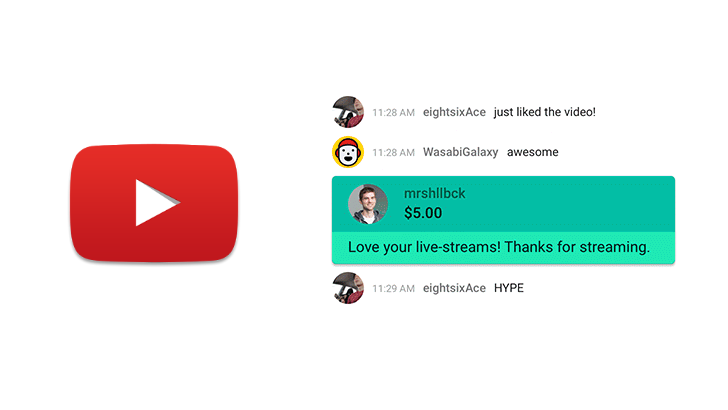 To combat this, YouTube has introduced Super Chat, a way for commenters to get more noticed by their favorite content creators by paying to pin comments to the top. The way Super Chat works is by allowing individual users to pay to promote their comment for a temporary period of time (up to 5 hours). The comment is highlighted and pinned to the top of the comments, and the creator who is hosting the live stream can reply. To send a Super Chat, send a dollar sign in the live chat, then select 'Send a Super Chat'. Drag the slider to the desired value - more money means more/longer exposure, plus different colors the more you pay - or enter a value. You then enter your message - which is character limited depending on how much you pay - and press buy. The message will send, and your Super Chat will be promoted for whatever length of time you purchased, with a timer on it saying how much time remains. It's similar to Twitch Cheers, which allows a user to purchase 'bits', which are then used to purchase cheers, affording them more exposure in comments. Of course, this has another, ulterior motive: adding in another revenue stream for the live streamer. This is a good thing, especially when many don't feel they get enough from ads anyway, and Fan Funding is going away as well. But what I don't like is the extra attention this gives people, exacerbating the whole 'look at me' culture which is rife on the internet. Anyhow, Super Chat is in beta for the moment, with YouTubers such as iHasCupquake, buzzbean11, and Alex Wassabi. It'll be launched widely on January 31 for creators in 20 countries and viewers in more than 40.